Elected on a platform emphasizing family values and abstinence education, he resigned in 2010 after information surfaced that he engaged in an affair with a young staffer -- allegedly one Tracy Meadows Jackson. Both the staffer and Souder are married, and it is against House ethics rules to be romantically involved with aides. 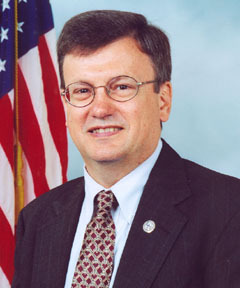 Ironically, in November 2009 Jackson interviewed Souder on the subject of abstinence, with the video posted on the Congressman's official website. In a statement issued upon his resignation: "I sinned against God, my wife and my family by having a mutual relationship with a part time member of my staff... I am so shamed to have hurt those I love." Succeeded in Congress by Marlin Stutzman. Church of the United Brethren in Christ.